Good quality rabbit pellets (approx. 1 cup per day) - note some are too low in fibre and grass hay is preferable. Green leafy vegetables, 2 packed cups per kg of rabbit bodyweight per day. Potatoes, Rhubarb, Cabbage, Beans, Salads with dressings, Cakes, Onions or Pickled foods. Anything not fresh enough for you to eat yourself. 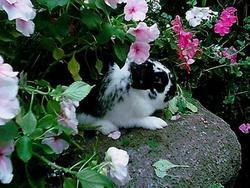 Rabbits are naturally healthy, hardy animals, and will remain so provided you take care of them. Rabbits kept in clean, well ventilated, draught-proof hutches, fed only the freshest of foods and sheltered from the harsh Australian sun will rarely, if ever, get sick. However, you should inspect your rabbit regularly for signs of ill health. If any of these signs are present, visit your Veterinarian without delay. Belly: Nice & plump but definitely not bloated. A bloated belly is a sure sign of a digestive disorder. Calicivirus (RCD) Virus introduced by CSIRO to control wild rabbit population. If proven effective, myxomatosis will hopefully, no longer be used. Infected rabbit will die within 12-72 hours of contracting disease. Rabbit will appear lethargic, then lapse into a coma and die. Vaccination of all rabbits over 10 weeks of age is essential. Annual booster vaccinations required. Coccidiosis Intestinal Parasites. Caused by feeding stale or polluted food Particularly common where feed is contaminated by mouse or bird droppings or where cages and bedding are not kept clean.. Rabbits suffers from weight loss, decline in strength and diarrhea Treat with Sulpha D (pet shop product) in drinking water. 6 drops of Sulpha D to every 500ml water for seven days. Repeat every six months, or on appearance of symptoms. discharge is also often apparent. A suitable hutch should measure at least 1200mm x 600 mm (4ftx2ft) and be at least 600mm (2ft) high. The hutch should be of sturdy construction, impenetrable by dogs or cats. The ideal building material is untreated Pinewood. The cage should be designed so that all internal walls are smooth as bunny will chew anything he can get his teeth on. Avoid cages made of metal. They are icy cold in Winter and unbearably hot in Summer. A solid wood floor is best. Wire floors, whilst easy to clean, are uncomfortable for bunny to walk and lie upon. Cover cage with mosquito mesh and place in a protected area so it is not exposed to the hot midday and afternoon sun. Several inches of bedding should cover the floor. Wood shavings, rice hulls or straw are all suitable and can be obtained from any produce merchant. Used bedding is ideal for garden fertilizer & mulch. Rabbits With Attitude Stud & Boarding will care for your bunny whilst you are away. Full Board costs only $5.00 per day for one rabbit, $3.00 for each additional rabbit. Air conditioned, mosquito proof hutches. Veterinarian on premises. Rabbits were designed to be prolific breeders. They have a very strong urge to mate and reproduce. If you are not planning on breeding, I recommend you have your pet rabbit desexed at approximately four to five months of age, before his or her sexual hormones begin raging. Your rabbit will be much more contented if not sexually frustrated, and will therefore be a much happier and more loving pet. Purchase heavy ceramic food and water bowls that bunny cannot tip over. Consider using a water bottle instead of a bowl. Bottles are more hygienic as bunny cannot foul the water. If using a bottle, always check that the ball at the end of the nozzle moves freely and has not become stuck. Rabbit's teeth are constantly growing and they need to wear them down. Give your rabbit a piece of untreated pinewood or a fruit tree branch to gnaw on. Trim your rabbit's claws regularly. Toenail clippers designed for humans are ideal. Avoid cutting the quick (blood supply). Never leave your rabbit unattended indoors as his natural desire to gnaw will lead him to chew your furniture, electrical wiring, carpets, etc. Toilet train your rabbit by placing a litter tray, filled with wood shavings, in his favourite toilet spot. Add a few of his droppings to help him get the message. Rabbits are best kept on their own. Undesexed Bucks will fight (often to the death) when they reach sexual maturity. Two baby Does can be raised together, however they may bond to each other, rather than to you. If separated for enough time, they will fight when placed together again. If you really can't bear to have only one bunny, consider buying a buck and a doe and having the doe desexed. Do not house your rabbit with birds or guinea pigs for company as they are chronic mite carriers and will pass on the problem to your rabbit. Some bunnies will also bully guinea pigs unmercifully.